One of the most admirable things about Supergirl is its boundless ambition: It seems there’s no corner of the DC Universe too strange for it, and there’s no place or story that its world can’t explore. 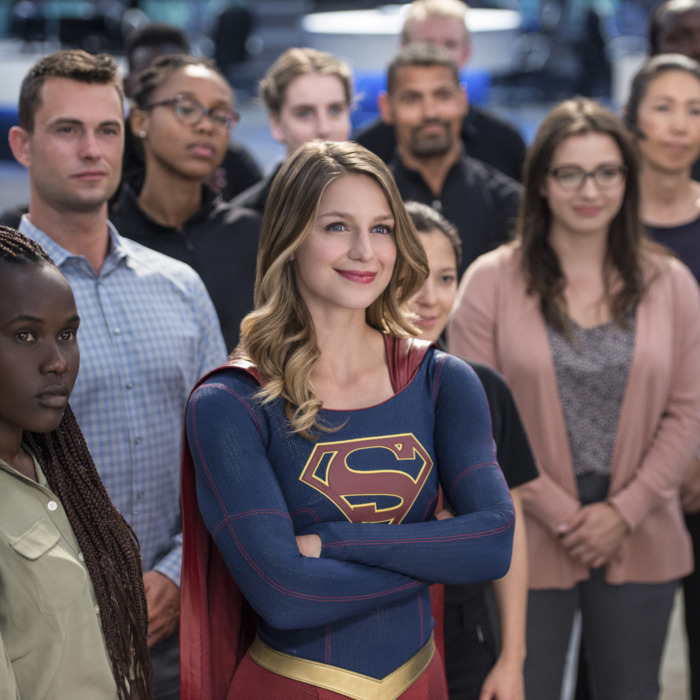 Last season, the show displayed that ambition through the slow reveal of Hank Henshaw as J’onn J’onzz, a moment that signaled it wouldn’t shy away from its comic-book origins and also focused Supergirl’s DEO membership as part of an ongoing mission to help out human-alien relations. With that theme in mind, “Welcome to Earth” is all about how the United States wants to offer aliens amnesty and citizenship. The president herself — played by none other than former Wonder Woman Lynda Carter — is in National City to publicly sign the corresponding executive order into law. Like all things political, everyone has an opinion and few people agree. J’onn is surprisingly hostile towards the idea, noting that most aliens cannot be trusted. (J’onn should know: He’s been tracking them all down.) He and Supergirl are exceptions that prove the rule — and it’s not like humans are all that great either, as experiencing humanity through a black body has taught him. I want to commend Supergirl for going there, because yes, race does affect the way a person experiences the world. It wasn’t all that long ago that pop culture didn’t want to approach this topic, so kudos to the show for acknowledging it. But the optics are a bit off here, and J’onn’s views too quickly stated. His stance seems flimsy and rings false when held against the subtext this episode summons in its support. Kara, being the only other alien working for the DEO, is ideologically opposed to Hank’s view. She’s more optimistic than pragmatic until she is confronted by her own prejudices, as the comatose Kryptonian wakes up and grabs her by the throat. Except he’s not Kryptonian — he’s a Daxamite, a closely related species from a planet neighboring Krypton, full of “hoodlums” and ruled by a monarchy. When POTUS comes under attack following her arrival in National City, the Daxamite becomes Supergirl’s primary suspect. She’s wrong though, blinded by her prejudice. This is something I have a little bit of a hard time buying, given that Kara is almost entirely defined by idealism. It rings very false that she would be so willfully prejudiced against anyone. Perhaps Supergirl wants to argue that even decent people hold irrational prejudices. Sure, that’s true — and particularly relevant in a year that has had to endure the presidential candidacy of Donald Trump — but the growth Kara has gone through seems to run counter to that idea. It doesn’t render her immune to instilled bias or close off this lane of storytelling, but it does demand more of a steady, nuanced approach, not the simple one deployed in this episode. In some ways, “Welcome to Earth” echoes the first season episode “Strange Visitor From Another Planet,” in which a White Martian came to Earth, wreaked havoc, and we learned about J’onn J’onzz’s Martian history. It too dealt with themes of xenophobia and bigotry, but not so directly, and the politicians were reactionaries who needed to be won over. Conversely, “Welcome to Earth” gives us a POTUS who is ready to offer amnesty to an alien who is falsely accused of wreaking havoc and a second (guilty) alien with legitimate grievances to air. There’s a lot happening in this episode, and although it stumbles in its execution of these ideas, it also does a lot to open up the show’s world in a number of exciting ways. The most exciting being … Detective Maggie Freaking Sawyer. Working together, Sawyer, the DEO, and Supergirl discover that the presidential saboteur is an alien woman named Scorcher. She has sick fire-slangin’ powers and a beef that sees amnesty as registration in friendlier terms, forcing aliens to out themselves to a hostile public. That’s a weighty, interesting idea, and I hope Supergirl continues to examine it. Winn-ing and Losing: In which I continue to be bummed out by Winn’s scant screen time. I will not suffer this much longer. “Welcome to Earth” leans in on CatCo as a news organization on several fronts, most involving Snapper Carr. He first undermines James’s authority by dismissing his approach and asserting control over an editorial meeting, and then he gives Kara her first dressing down for editorializing a straight news report. The latter causes Kara and Lena Luthor to continue on a path to friendly terms, making a scathing piece far more neutral in tone (and, in a fashion, inadvertently showing off the hazards of the good ol’ view from nowhere). We also witness a wonderful comeuppance by episode’s end, where James rewrites Snapper’s copy to reassert himself as boss and hella-smug smirker. Speaking of Lena Luthor, I wonder if Supergirl will pull a Smallville and have her and Kara become friends, only to tragically put them at odds. KARA DOES THE WONDER WOMAN TWIRL TO PUT OUT A FIRE SOMEONE PLEASE GIF THAT. How do we feel about Mon-El? Is this the start of a will-they-won’t-they thing? It feels like the start of a will-they-won’t-they thing. Although she’s not in the episode much, Lynda Carter is wonderful as POTUS, and Kara geeking out over her is wonderful. And what about her last scene — is she an alien, too?! Speaking of last scenes, how about that final tag? J’onn J’onzz meets M’gann M’orzz! Miss Martian is here! This is so exciting.